This week's Historical Femme Feature is brought to us from the blog of marine geophysicist and science artist Ele Willoughby! A beautiful linocut portrait of the featured scientist is available for purchase via her shop. Beatrice Worsley (1921 - 1972) was the first person in the world to earn a PhD in computer science. It's interesting how Trixie Worsley, who is believed to have earned the very first doctorate in computer science, supervised by Douglas Hartree and Alan Turing at Cambridge, is often identified as "the first woman in the world to earn a doctorate in computer science" as if the idea that she was the first person to do this had not even occurred writers. She was a woman, so she must be the "first woman," and an imaginary innovative prior man is implied. Amongst the first computer scientists in Canada, she was certainly the first woman in the field here. She focused on writing software, development of computer libraries, scientific computation and was co-author of the first compiler Transcode (vital to physicists) as well as teaching in the new field of computer science. Her work provides insight into the history of the nascent field of computer science. She published her computational insights and solutions for problems in physics, biology and computer science. Beatrice Helen Worsley (1921-1972), a quiet and accommodating girl known as Trixie, was born in Queretaro, Mexico, to English parents who had moved to Mexico so her father could work in her mother's family's textile mill. This mill had been destroyed by rebels in 1917, and Trixie's future parents had had to move again so her father could instead work for Rio Grande group’s CIMSA mills. Trixie's mother home-schooled her and her older brother, and the family remained cut off from the local community for safety during this turbulent time in Mexico's history. In 1929, the family moved to Toronto, mainly for the sake of the children's education. Trixie attended Brown public school for a few years before going to the private Bishop Strachan School, where as the top student of her day, she excelled in the university track classes. She graduated with honours in 1939, winning awards for math and science and the Governor General's Award for the highest grades in the school. She entered Trinity College at the University of Toronto with both a general proficiency entrance award and the Burnside Scholarship in Science. Getting top marks in most of her classes she won more scholarships and transferred to Math and Physics in 1940, specializing in applied math. She first saw computers during a summer job in the actuarial department of the Manufacturers Life Insurance Company in Toronto in 1942. As soon as she completed her bachelor's in mathematics at the University of Toronto in 1944, she enlisted in the Women’s Royal Canadian Naval Service, known as the Wrens. As a researcher at the Naval Research Establishment at Her Majesty’s Canadian Ship Establishment Stradacona, in Halifax, NS, she focused on harbour defence. Worsley was one of 6 Wrens amongst 50 scientists, officers and support staff, who were responsible for things like degaussing ships to limit their magnetic signature and vulnerability to German magnetic mines, torpedo guidance and researching different techniques for harbour defence. Most of this group left the service within a year of the end of the war to pursue further education, with the special opportunities offered to veterans. A small number including Worsley, the only remaining Wren, stayed on. The newly promoted Lieutenant Worsley began researching the badly understood electrochemistry of hull corrosion in 1945, performing experiments at sea. She set the Wrens' record for time at sea, at 150 days, including during the rough mid-winter months. Her endurance and knowledge earned her the respect of the crews, even doing what she called a man's job. She demobilized in 1946 to pursue further education. She went to MIT for a master's in math and physics with Henry Wallman, at the Radiation Laboratory, where she was exposed to computers and wrote a thesis called Mathematical Survey of Computing Devices with an Appendix on Error Analysis of Differential Analyzers. There were only really a handful of computers out there at the time, in universities, industry and national labs and she surveyed the literature on all of them as well as those planned, and began to be an expert on this new technology and to wish for a future in the field. Returning to Canada in 1947, where there were not yet any available jobs in computers, she worked at the National Research Council (NRC) in Ottawa as an aerodynamics research officer in the mechanical engineering division, but it didn't hold her interest. She managed to negotiate a move to the new University of Toronto Computation Centre - the only existing Canadian computer R&D program - as one of two project assistants in 1948 (hired for $200 month). She and her colleagues worked on tabulating results for Atomic Energy Canada (AEC) in Chalk River. Worsley used Mechanno to build her own differential analyzer with small improvements on the design published by Douglas Hartree and Arthur Porter in 1935. This was a cheap device, one of about 15 ever built worldwide, that was accurate enough to solve many scientific problems. Worsley and the other project assistant were sent to Cambridge to learn about EDSAC at the Cambridge Mathematical Laboratory in 1949. 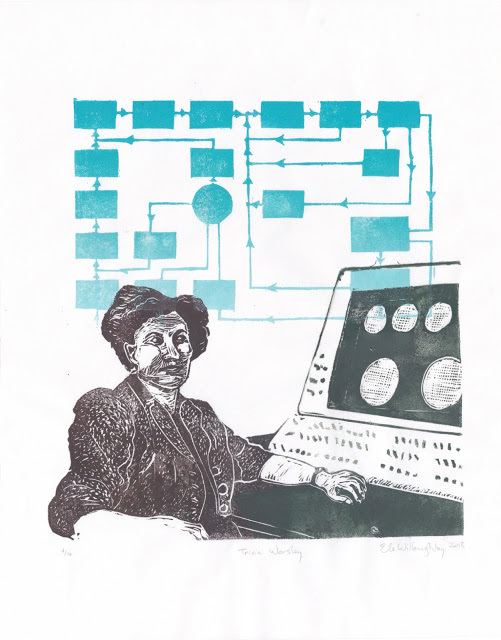 Worsley co-wrote the first program to run on EDSAC and her report on the machine's first run was published in the proceedings of a meeting on high-speed computing at Cambridge that June. She didn't return to Canada because she started her doctorate at Newnham College, with Douglas Hartree as supervisor (with Alan Turing and Maurice Wilkes). She returned to Canada before completing her dissertation but math professor Byron A. Griffith agreed to supervisor her till she completed her work. Hartree approved her thesis, Serial Programming for Real and Idealized Digital Calculating Machines, and she was awarded a PhD in 1952 and then published her first scientific paper. Hers is believed to be the first doctorate awarded involving modern computers. Trixie Worsley, linocut 11" x 14" by Ele Willoughby, 2018. Meanwhile, the ambitious (and expensive) design and construction project of Canada’s first computer, the University of Toronto Electronic Computer Mark I (UTEC) was underway, aiming to produce a nationally-shared university, government and military resource. Plagued by mechanical problems and tube failure, the head of the AEC argued that funding should be withdrawn and moved to purchasing a completed system, the Ferranti Mark I in 1952. Worsley herself named the machine FERUT for “Ferranti computer at the University of Toronto,” and operated the new machine, creating software for everything from problems in atomic physics to the St. Lawrence Seaway calculations. With her colleague Gottlieb she taught courses on its use, but it was notoriously difficult and almost all their students quit. Worsley then worked with physics professor J.N. Patterson Hume, to write a compiler called Transcode, to make higher-order programming possible - a much easier method, if slower to execute. Allowing users to program in a language, rather than machine code, and enter numbers in decimal, rather than binary, hugely simplifier their task and had a huge impact on computing in Canada. It allowed dozens of research groups nationwide to use FERUT to solve a wide-array of scientific problems. Transcode was an immediate success and hundreds of people learned it before the FERUT was replaced with an IBM 650 in 1958. Despite her education, publications and teaching track-record, Worsley was repeatedly passed over for promotion and received less recognition than her (male) peers. 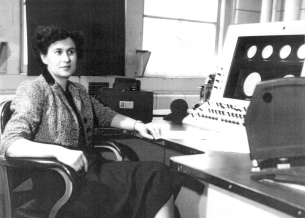 She was only promoted from Computation Centre mathematician to assistant professor of physics in 1960. Worsley published more papers than any of the other staff of the Computation Centre in the 1960s as her career veered towards teaching. She was promoted to associate professor of physics and computer science when U of T started a graduate department of computer science in 1965. She left U of T in 1965 to join Queen's University Computing Centre in Kingston, Ontario, likely influenced by her slow career advancement and treatment as a woman researcher at U of T. It caught her colleagues by surprise as she was moving to a University without a computer science program, only an outdated IBM 1620 and would be computing advisor to the Computing Centre with teaching duties, but not a professor. But, she was lured there to start the new Computing Centre and start anew. A new department of Computing and Information Science was created in 1968 complete with master's program thanks largely to Worsley's efforts and she was promoted to associate professor. In 1971 she took a sabbatical at the Department of Applied Analysis and Computer Science at the University of Waterloo to study assembler coding and computer architecture, but she had a fatal heart attack at age 50 on May 8, 1972. After her untimely death, Worsley left her entire estate to Cambridge University to set up the Lundgren Fund, in honour of Helge Lundgren, for doctoral math or science students with preference to those in computer science "whose research has been interrupted by national service or personal misfortune." Scott M. Campbell who wrote the great biography of Worsley for the IEEE has been unable to identify this Helge Lundgren, though he suspects this might be tied to whatever it was that drew Worsley suddenly back to Canada before she had finished her doctorate. I was surprised how much of Trixie's career I could relate to directly. I've spent much more than 150 days doing research at sea, but never (in the Northern Hemisphere) later than a fairly miserable, snowy October. I have a pretty good sense of what it would have been like on the North Atlantic in the mid-winter. Her work as a WREN was on electrochemistry of hull corrosion. As someone who has done marine electromagnetics, I know this is still an active research topic for my naval colleagues. Her doctoral thesis included a great variety of problems, but one, the calculation of second-order corrections to the value of gravity from pendulum measurements at sea is something I know about as my own doctorate involved adapting a gravimeter to use at sea. I've shown Trixie based on a photo of her seated in front of the FERUT, and other images of the machine. I was influenced by my former colleague at U of T Physics, Gordon West's descriptions of the first computers they used and peering directly into the memory of the machine themselves through its output oscilloscopes. MIT makes her master's thesis available, so I looked it up but ended up opting to try and allude to her career as a programmer (rather than a hardware researcher) by reproducing the structure of a flow chart from one of her papers about computation methods in atomic physics. Scott M. Campbell, "Beatrice Helen Worsley: Canada's Female Computer Pioneer," IEEE Annals of the History of Computing, volume 25, no. 4 (Oct-Dec 2003), p.51--62. Smillie, Keith (2002). "Beatrice (Trixie) Worsley". The Computer and Me - A Restrospective Look at Some Computers and Languages. Ele Willoughby is a marine geophysicist and science artist. You can find her on twitter, instagram, Facebook, her blog, etsy. and society six shop.